Husky has been making Husky floor liners for years – hey have a great name, and are known to produce quality products. 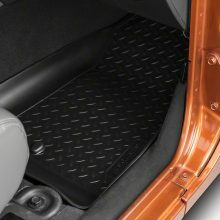 They have several model floor liners / floor mats, and have really become the goto source for custom fit floor liners. 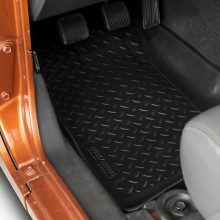 Lately I’ve been seeing more competition, from companies like Rugged Ridge, and Weathertech, but for my money, I still prefer Husky floor liners. I purchased my first set of Husky liners in 2009, for my Jeep Wrangler TJ, and I’m still running them to this day. They hold up great, don’t get too hot (I have gray), and look fine. Personally, I own the front, rear, and cargo area Husky Floor Liner (not the X-Act Coutour or the Weatherbeater, I can’t speak to those), and couldn’t be happier. 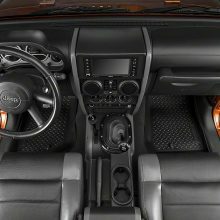 They have a firm / ridgid construction, so they hold water well, and you can easily come home and shop-vac the water out – you can’t really lift the liner out to dump water, because the angles just have you dumping the water into your Jeep. 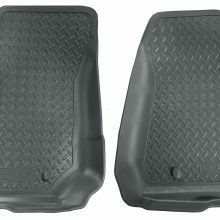 I’ve noticed that they are slightly more slippery than most floor mats (as in your foot slips on the liner), especially if you armor all them. The only other cone I’d mention is that if you get caught out in the rain, and it soakes your carpet, you have to remote the Husky liners if you every want the carpet to dry out – they will trap mositure under the liner. This is likely true of any floor mat though.